Alison Shaffer: Purex Back 2 School $1,000 Sweepstakes is on now! 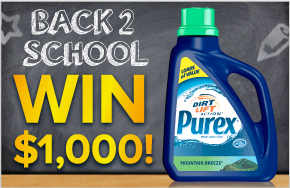 Purex Back 2 School $1,000 Sweepstakes is on now! Start Back to School with a happy note! Enter to win $1000 in Purex Back 2 School Sweepstakes. Head on over to Purex.com and fill out the simple form with your name, address, email, phone number and hit enter. It's that easy to enter. From August 2 - August 30, Purex will be providing one lucky winner with a $1,000 in their Back to School Sweepstakes. Disclosure: The comments and views are my own. By sharing this information about the sweepstakes, I am entered into a prize drawing.